Download the solution paper now! SS7 has long been established as the primary signalling protocol used in today’s fixed and mobile networks. As such, operators are asking the question: how can we connect our services to an IMS-based or Diameter-enabled network from legacy infrastructure? The solution comes from the deployment of specialist, custom solutions that solve individual problems and collectively provide a platform for incremental future network evolution. The Squire Technologies 3GPP compliant SVI_IWF (Interworking Function) enables legacy solutions to be extended to LTE and IMS networks, with flexible deployment options, customised interworking intelligence, and providing the foundation for a step-by-step approach. Click here to download the IWF solution paper. Mobile Number Portability is an essential function that Mobile Network Operators are required to support. Although many aspects of Mobile Number Portability are standardised, differences in implementation mean that MNOs are frequently challenged to ensure compatibility between entities in their networks and between others. Our briefing paper outlines a number of challenges in the implementation of Mobile Number Portability and presents solutions that help ensure smooth and consistent service operation. 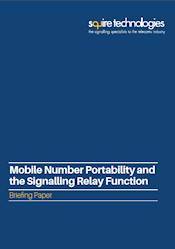 ​Click here to download Mobile Number Portability and the Signalling Relay Function.